Professor Takagi (Ph.D. Engineering) graduated from the University of Tokyo’s Department of Mathematical Engineering in 1976, after which he held posts such as associate professor at the Kyushu University Educational Center for Information Processing and professor at the University of Tokyo’s Institute of Medical Science. He became a professor in the Department of Biological Sciences in April 2014. Other current positions include head of the Japan Science and Technology Agency’s National Bioscience Database Center and head of the National Institute of Genetics DDBJ Center. Wouldn’t it be nice to know what kinds of disease you’re most likely to suffer from in your future? In recent years there have been amazing advances in genomic analysis technologies, promising the potential for life planning according to your own personal genome. For example, the actress Angelina Jolie recently made news when she learned of a mutation in her BRCA1 gene, which normally functions to suppress tumor development, and as a result decided to undergo a voluntary double mastectomy. We are entering into an age where deaths from illness may be prevented through prediction of its occurrence. Bioinformatics is the tool that enables us to make these predictions. Before completion of the Human Genome Project in 2003, we did not have a clear overview of human genetics, and searching for genetic factors related to disease was akin to groping about in the dark. Since the human genome was fully sequenced, however, we now can apply a more data-driven approach. Technology-driven effects are also increasingly seen as genome analysis equipment becomes increasingly lower-cost and higher-performing. The cost of analyzing an individual’s genome was at one point on the order of billions of dollars, but has now fallen to a few hundred dollars. This has ushered in the age of personal genomics. Against this background, our approach toward biology has become increasingly one of engineering. 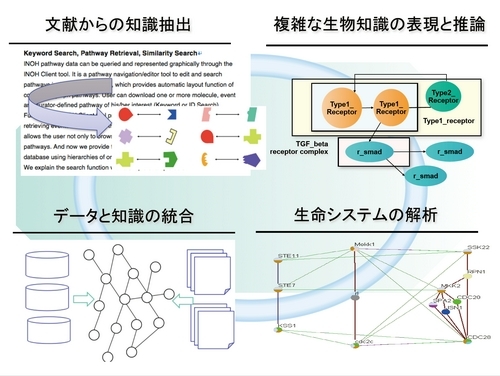 “The ultimate goal of our research is to learn how to reconstruct biological systems within a computer,” says Professor Takagi. To effectively apply meaning to experimentally derived genomic data, Professor Takagi’s research focuses on ways to associate knowledge and data. As an example, say that you have two very long scientific papers. The first describes the relation between genes A and B, while the other discusses the link between gene B and some disease C. Combining the knowledge contained in these papers may indicate an association between gene A and disease C, and how gene B is involved. Unfortunately, the current situation is that there are tens of thousands of such papers, many of which describe the same phenomena using different languages and terminology, making it extremely difficult for a single researcher to find relations between them. 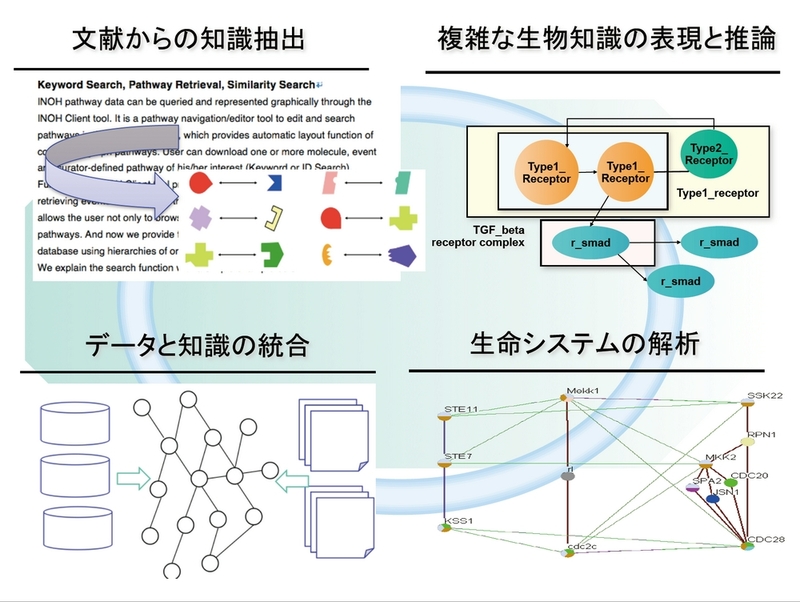 Professor Takagi is working to promote standardization of this data, and working to develop a database that with the cooperation of researchers from around the world will combine all biological data into a form that more clearly shows causal relations. We are aided by the fact that the genome is already encoded in a digital-like form, using only the symbols A (adenine), T (thymine), G (guanine), and C (cytosine). What’s needed now is IT engineering to find ways to best manipulate that data. Biological researchers in the future will increasingly be required to don the cap of biological engineers. The Takagi Laboratory places a high emphasis on freedom. This is necessary for making new discoveries as we transition from traditional biology to biology that examines phenomena from an information perspective. As an example, Ryo Ozaki (D2) is looking for ways to use data obtained from next-generation sequencers to comparatively analyze the genomic evolution of fish. “As sequencer performance continues to improve, we’re finding new hypotheses related to how seawater and freshwater fish have adapted to their environments,” he says. Through the use of computers, the biological engineers of the future will plunge deeper into the mysteries of life. The main research areas taken on by the Takagi Laboratory. Their goal is an understanding of life systems through integration of data and knowledge. “I like that we’re able to converse on equal ground, something beyond the typical teacher–student relationship.” (Ryo Ozaki, D2).